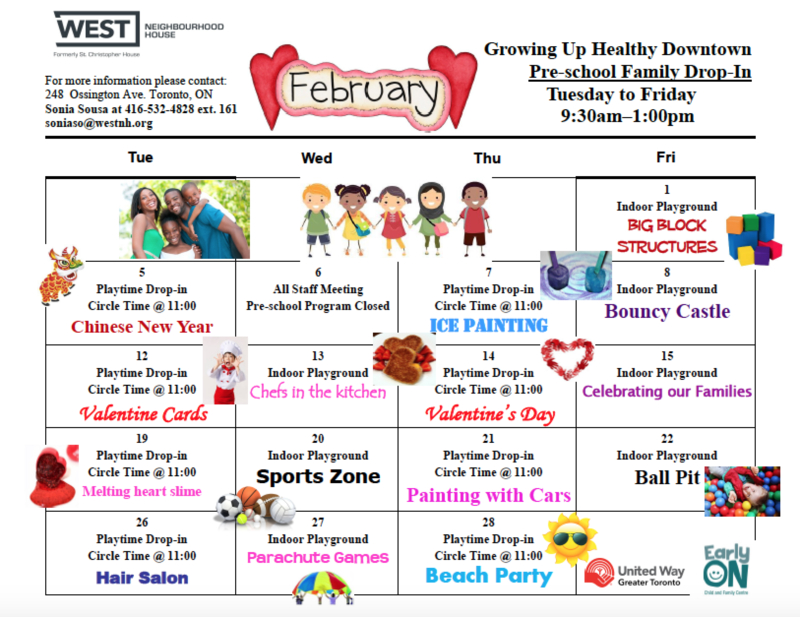 Growing Up Healthy Downtown (GUHD) is our pre-school drop-in program at West NH! GUHD is an 8 agency collaborative health promotion partnership providing programming and support for families with young children (0-6) living in downtown Toronto. Parents/caregivers and their children (0 to 6 years old) are invited to drop in to this program and take advantage of our friendly atmosphere. This program is designed to facilitate family/caregiver support where children and their family/caregivers can interact with one another and learn and play together. Drop-in activities include an indoor playground, arts and crafts, music and movement and parent relief. There is also a summer school readiness program offered in the summer to help prepare 4 and 5 year olds for the transition to school. The program is located at 248 Ossington Avenue and operates Tuesday, Wednesday, Thursday and Friday mornings between 9:30 am and 1:00 pm. There are no fees for the drop-in program. This program provides free on-site childcare for children 0 to 6 years of age for up to two hours. Parent relief takes place during the hours of Growing Up Healthy Downtown (see information on days/hours above). Please book your parent relief at least 24 hours in advance, in person or via telephone by calling (416) 532-4828 X 161. Please make sure you speak with someone to book your parent relief as no voicemail bookings will be accepted. There are no fees for the Parent Relief Program. 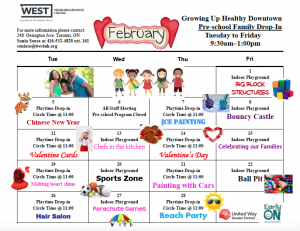 See what the program is up to this month by clicking on the calendar below. For more information please contact the Children, Family & Youth Programs Coordinator at (416) 532-4828 x 126.